A sit and stand stroller are an alternative to side-by-side double strollers or tandem strollers. They offer space for both babies and older children. Whether you’re going to a festival or the park, having a sit and stand stroller makes taking more than one child out a lot easier! Why Do You Need a Sit and Stand Stroller? Do you have a toddler or an older child and a new baby? Preschoolers don’t typically want to ride in a stroller. They aren’t babies after all! Even though they’re older, their legs get tired, and they want to take a rest. A sit and stand stroller gives your big kid a place to sit when his legs can’t go any further. They can sit down and take a break. Perhaps you’ve never seen this style of stroller before! Imagine a stroller with a regular seat for the baby with a standing platform or bench seat in the back for the toddler or preschooler. The bigger child has a place to sit, but they also have the freedom to get on and off of the stroller when they want, so long as you haven’t strapped them in. How Do I Know if a Sit and Stand Stroller is Right for my Family? This question is important! There is a difference between a double stroller and a sit and stand stroller, so you need to decide which one is right for your family. In general, if your two kids have an age gap of 3 to 5 years, consider a sit and stand stroller. Double strollers are better if you have a smaller age gap. Sit and stand strollers are better when you have one child that is more independent and capable of walking with you. An example is going to an amusement park. Your child might be 4 years old and capable of walking with you, but his legs get tired. When he wants to sit, he can use the bench seat. When you need to move it a bit faster (like in the parking lot), he can stand up in front of you. It provides the opportunity to build independence while still recognizing that he has limitations. How do you decide which sit and stand stroller is for you? Think about the features that matter the most to you. Sit and stand strollers can be heavy, and you have to think about your ability to lift this stroller in and out of your vehicle. Is it too cumbersome for you to lift if you’re alone? Plus, you have to consider if it will fit into your vehicle’s trunk.While all sit and stand strollers are larger than traditional strollers because of their design, you can find some that don’t weigh as much. Look at the weight limit for each seat, and think about your older child’s current size. While most older children don’t grow as fast as infants, you do want the stroller to last a year or two for them. A lower weight limit may not be wise if you have bigger kids. Storage matters. Most parents agree that the more storage available, the better the stroller is. You want a decent sized storage basket under the seats. Make sure you can reach the basket as well because the bench seats often hide the basket. Safety is a factor that every parent needs to consider. Most importantly, ensure that both seats offer beats. The bench seat should have a 3-point harness, and the full seat needs to have a 5-point harness. You need to be able to keep your children contained when necessary for their safety, even the older child! Your children want to be as comfortable as you would want to be. Does your older child have enough space on his bench? Are the seats nicely padded? Sometimes, the extra features are what make a stroller stand out in the crowd. Does it offer parent organizers and cup holders? Does the child have his own cupholder? Look at the stroller canopy as well. Some companies excel at the extra features! The market isn’t flooded with sit and stand models, so that does make it easier for parents to pick the right stroller for their needs. Baby Trend is a popular brand of strollers and the Ultra Tandem holds children up to 50 pounds each. This model is made by the company who created the very first sit and stand stroller. Since they started it first, Baby Trend has spent time tweaking the concept based on reviews and suggestions. 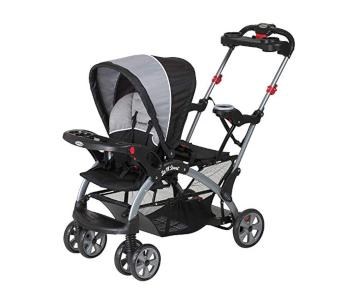 Unlike other sit and stand strollers, the Ultra Tandem is easy to maneuver. You’ll find that it’s easier to steer around corners than other brands, so it’s a great choice if you plan to use it while shopping often. Both seats have harnesses: 5-point in the front and 3-point in the back. One downfall is that the Ultra Tandem is quite large, even when folded. That tends to be a problem with any strollers, but you should consider the vehicle you drive. If your car is small, the Ultra Tandem may not be the best choice. Here is another great choice by Baby Trend. The main difference is that this stroller has a full-size rear seat. 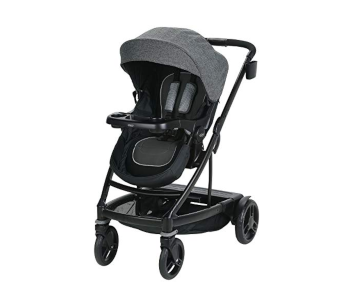 Parents can remove the rear seat to convert it to a traditional sit and stand stroller. Parents of twins may like this stroller because both seats will accept an infant car seat. You should note that this stroller ONLY works with Baby Trend car seats. While some parents say that their other-branded car seats work, Baby Trend made this stroller to work with just their infant car seats. It’s not recommended to try other ones! Parents love that the child seats both include trays and cup holders, which isn’t a feature you see in all double stroller. These trays are removable and swing open to make it easier for you to put the baby in his seat. Parents also have cup holders. Where else would you keep your cup of coffee? This stroller is easy to push and easy to use in general. Baby Trend has a one-hand folding system, so you can hold your baby in one hand while collapsing the stroller. It’s really easy! Unfortunately, you will need two hands to get the stroller into the trunk of your car. The one negative to consider is the length of the Baby Trend Double. Overall, this stroller is long, so the size can be a downfall. Also, with two full-size seats for kids, the storage basket can be tricky to access. Hard to reach the storage basket. The Graphite marks high on the list for several reasons. First, Joovy offers a two-year warranty which isn’t usual at all. Also, they include a universal car seat adapter. This stroller is a steal – price wise. The price is affordable and won’t break the bank, but you’ll feel like you just scored a fancy stroller. 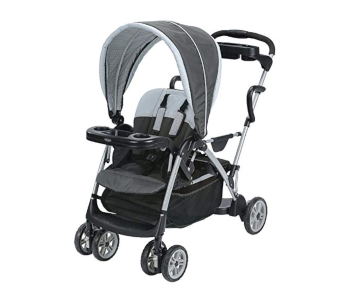 It is smaller and more compact than other strollers, so it doesn’t feel like you’re driving a bus. The front seat has a tray and cup holder as well as a large sunshade. A few drawbacks of the Graphite include the lack of a parent console and the shape of the handlebar makes it hard to attach an organizer. Also, the shape of the handles makes it a bit harder to push this stroller. The basket is a bit smaller than preferred. Also, if you use the infant car seat, it does leave very little space for your older child on the bench seat. This stroller may not be ideal if you have a small age gap between your kids. 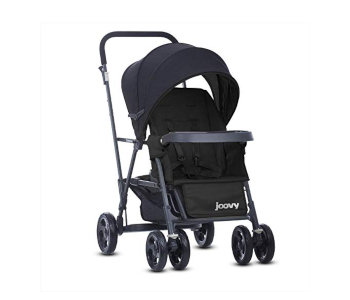 If you love the style of the Graphite but want the option to have two full-size seats, take a look at the Joovy Caboose Too Graphite Stand-On Tandem Stroller. It’s the same stroller with the same features, but they added a removable, full-size rear seat that reclines! If you’re a fan of Chicco products, you’ll love their BravoFor2. This stroller is quite different than the traditional sit and stand strollers! It has a traditional stroller seat plus a back seat and a standing platform. The back seat faces towards the back, and it’s more like a small bench seat. The bench seat has a 40-pound weight limit. 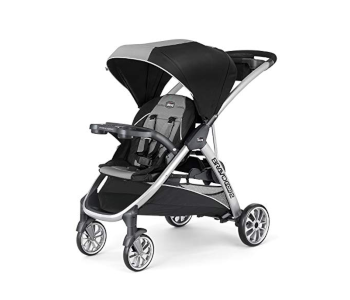 Chicco added plenty of features that parents love like an adjustable 5-point harness, a large canopy, and a detachable child tray. Parents love the console with a zippered pouch, perfect for items you want to keep safe, and the two cup holders for parents. You can fold the back seat away when not in use, making it easier to access the storage basket underneath. This stroller works with the Chicco brand infant car seats, so you don’t have to take your infant out of the bucket seat when he’s asleep. However, it ONLY works with Chicco car seats, so that might be a deal breaker for you. Unlike other options, there is enough space with the infant seat attached to give your older child room to be comfortable. Of course, there are a few flaws to consider. The cup holders aren’t the best and tend to feel a bit flimsy. The handle doesn’t have a height adjustable, and many parents note that this stroller is quite heavy to lift! Also, the front seat doesn’t offer a full-recline, which might interfere with how baby naps! If you have some room in your budget, the Uno2Duo is a unique and versatile double stroller that parents love. It starts off as a single stroller then changes to a double when you have another child. There are eight – yes 8 – ways to ride. It doesn’t get more versatile than that! Graco created a durable, well-designed double stroller that grows with your family. That’s such a nice feature because it means you don’t have to buy a new stroller when you decide to add another baby. The stroller has a cup holder and a phone holder, along with ample storage. Graco sells additional attachments to make life easier for you. The Uno2Duo does have a few negatives. It’s large and heavy, then it doesn’t fold too compactly. Plus, it might take you a while to assemble together. Those things are frustrating for sure! 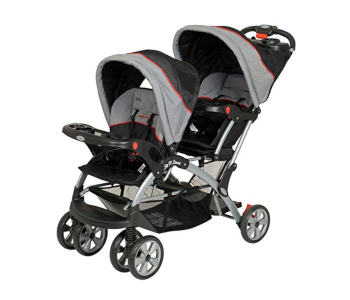 Graco does offer another similar stroller – the Graco Uno2Duo Double Stroller. It comes with a full-size rear seat and offers 11 ways to ride. In terms of weight and affordability, the Graco RoomFor2 is similar to the Baby Trend Ultra. It has nice features that parents desire like a large storage compartment, a parent tray, and a snack tray, which is where you can attach the infant car seat. This stroller works with all Graco infant car seats, along with other brands for your convenience. Graco made sure the built-in suspension was on-point for easy maneuvering. One unique feature is that the RoomFor2 front seat features a flat recline position. Most don’t! It has a 2-step brake for additional security. No runaway stroller for you! You aren’t able to put the stroller on the back seat. That can be a deal breaker for some parents because they often want to keep the baby close when they’re so little! Infant car seats won’t attach in the back. A sit and stand stroller is a great investment for parents who have a larger age gap for their kids. It lets you contain your smaller child while giving your big kid independence and comfort at the same time. It’s hard to pick a winner in the battle of the best sit and stand stroller, but we pick the Baby Trend Ultra. Not only is it Baby Trend – the original maker of the sit and stand – but they also have all the features that parents want. Everything is included in a rocking, affordable price tag. That’s hard to beat! Do you have a favorite sit and stand stroller? Let us know in the comments!